Rosti.cz Review 2019: Is Rosti.cz a Good Hosting? 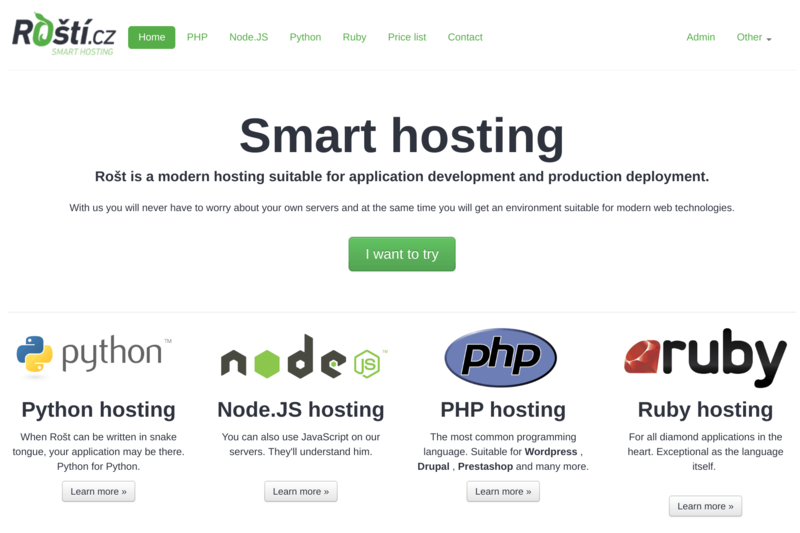 Rosti.cz provides “smart hosting” for software developers wanting to develop and host web applications written in PHP, Python, Node.js, and Ruby. Rosti.cz is a web hosting company based in the Czech Republic in Eastern Europe. This relatively small company focuses on hosting solutions such as PHP hosting, Node.js hosting, and Python hosting. Its website is only available in Czech. This vendor does not offer the traditional shared hosting services or the usual VPS and dedicated server solutions. It’s hosting services are aimed at PHP, Python, Node.js, and Ruby software developers. For PHP, it supports versions 5.6, 7.0, and 7.1 with no maximum execution time and no memory limit. The PHP hosting comes with 50 GB disk space and 4 GB of RAM and includes Apache. Python hosting plan allows both Python and Django 1.8 scripts, and this package supports several versions of Python including 2.7 and 3.4. Both SQL and non-SQL databases are supported, including Redis, MariaDB/MySQL, and PostgreSQL. Rosti.cz performs daily backups on a separate dedicated server with a three-day retention period. Customers can choose to use either TLS or Let’s Encrypt SSL certificates. Rosti.cz’s website doesn’t mention any uptime guarantee, and in fact, provides very little information about its infrastructure, maybe because it relies on other vendors’ data centers. 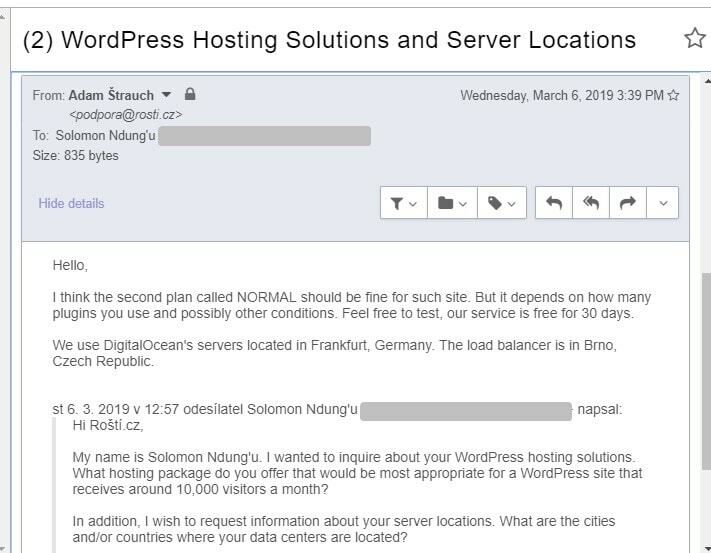 It uses DigitalOcean’s servers located in Frankfurt, Germany, with its load balancer in Brno in the Czech Republic. Rosti.cz’s hosting packages are a little bit overpriced considering the lack of some basic features. However, these are specialist hosting plans for web developers. Prices are displayed in Czech koruna, and there is no mention of any money-back guarantee. For self-support, the Rosti.cz website includes a detailed knowledge base. Rosti.cz offers special hosting solutions for software developers, which may be why they’re more expensive than you might expect. What puts me off more than the prices is the lack of information about this provider’s infrastructure and any uptime guarantee. On the other hand, the highly responsive support team does give me cause to be cautiously optimistic. Wondering how Rosti.cz stacks up against other Web Hosting companies? Enter any other Web Hosting company and we will give you a side-by-side comparison.